I have been very fortunate with my trips abroad this year so after Dubai I was of the opinion I was done for the year. Then the wedding invitation landed for 2nd January in New Orleans! Well, I thought, it would be churlish not to go, so on Thursday 31st we flew to New Orleans. We flew with United and were very impressed, although I’m sure my perception was influenced by the fact they were not charging me for my G&Ts, which they are supposed to do. When we arrived at Louis Armstrong, New Orleans International Airport, the place was buzzing. The Sugar Bowl event (Google 2015 Sugar Bowl for an explanation) takes place on 1st January in New Orleans so the city had 1000s of visitors arriving. 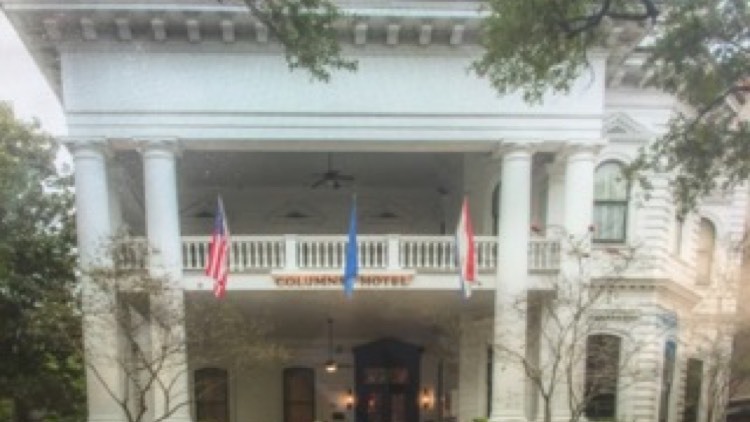 We stayed at The Columns Hotel. Originally built in 1833 for a wealthy tobacco merchant the story goes that “The columns are the only remaining example of Italianate style buildings in New Orleans” It has a large front veranda which overlooks the famous Saint Charles Avenue streetcar line, making this a favourite destination for watching the Mardi Gras parades. I’ve been to Mardi Gras three times and it’s the best fun. The wedding was amazing, amongst all the Victoriana of the hotel accompanied by what else but a Jazz quartet. If you love Jazzzzzzzzzzzzzzzzz – this is the place to visit. It’s all free, you will find Jazz buskers on the street in the French Quarter playing the best quality Jazz (well a couple of bucks donation maybe). The food, as always, NEVER disappoints. I’ve had the best food in this city. Louisiana Creole cuisine was created in New Orleans and has been influenced by Spanish, French, Italian, Irish, West African and Amerindian. Then there’s the influences of Cajun cuisine brought to Louisiana circa 1755 after the French speaking Arcadian people were deported by the British from Arcadia in Canada. Wow that history can only bring a culinary delight. That may be so, but after a day in The Quarter enjoying a Margareta or two, the best place to go to soak up any excess is Port of Call on the Esplanade. During Mardi Gras you have a 2 hour wait to get seated, today it was only 15 minutes. This place has been around since 1963, the concept is simple, burgers with jacket potato and salad along with any number of toppings. OMG they taste soooo good and only $12.50. The staff ‘s great, the food’s great and the house cocktail is also great. Y’all must visit New Orleans it’s my favourite city. This city is not for the faint hearted and if you need a lot of sleep – don’t go! BTW – the Cajun Bloody Mary is the best.